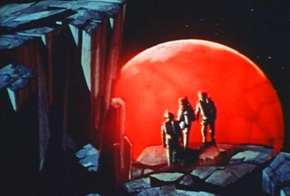 The Heavens Call is not only the first Soviet science fiction film about a (failed) space expedition to Mars – it actually appears to be the first Eastern European SF movie at all about outer space after the launch of Sputnik in 1957. Much more impressive than this schematic plot, however, is the vision of the cosmic future displayed in the movie. This vision was largely created by the main set designer, Yuriy Shvetz. For example, we are shown several times a circular orbital space station similar to the one in Stanley Kubrick’s 2001: A Space Odyssey (1968). The starry sky unfolds through the windows of the futuristically designed interior. In other scenes, cosmonauts are placed in front of a panorama of rising planets accompanied by declamatory classical music; while a waltz heard during a cosmonaut couple’s farewell is contrasted to the wild jazz rhythms that haunt the Americans left on Earth. In order to make the most of the film one has to look at it as a unique cultural document of its time. The film tells us something about the end of the 1950s, when the first man-made satellite marked, in Soviet propaganda at least, the “beginning of a new era”, the “cosmic period of mankind” when communism “overtook” capitalism. Around this time SF novels and stories featuring space travel became the most popular literary genre in the country. And cinema, the “magician, who is able to animate the past and to carry us away into the future”, was destined to show us how the “bold dreams of mankind” could become true and humanity could conquer outer space (2). Within this context movies about space travel were designed to demonstrate how, in the near future, such fantasies would be turned into reality. The Heavens Call realises this political agenda by introducing a young writer in a framing device who visits a research institute for space flight. He is guided through the institute’s museum where he finds not only models of the first Sputnik satellites, but also spaceships, orbital space stations, and fashionable spacesuits, all serving as inspiration for his new novel and which form the internal “plot” of the film. Thus, literary fantasies enable the cameraman to transform bold cosmic dreams into filmic reality. The role of literature as a source of filmmaking ideas is paralleled in the film’s plot. Different media (mainly radio, but also TV and other wireless communication technologies) help perform the task of creating a new cosmic reality. For instance, decisive cosmic events are shown in the movie as live transmissions to earth by Radio Moscow. At the same time, the film’s setting links the cosmonauts to their earthly origin, be it with the help of an extraterrestrial greenhouse, a television broadcast of ballet, the image of a domestic cat, or the longing for a beloved woman (wife or mother). Therefore, at a symbolic level, the film’s title contains a double meaning: it is not only the heavens that call for new adventures, but also Moscow that controls, via the media, all messages about outer space. At the same time it also structures the dominantly male fantasies about women, home and mother earth. Thus, by taking a closer look, the film reveals the role of the media in the production of cosmic fantasies, and documents the conservative character of dominant Soviet ideas about a communist future (3). However, if we compare the practice of filmmaking to writing literature we can note differences. Whereas a huge number of creative and productive Soviet writers were engaged in presenting alternative visions of the future, the few cinematic attempts concentrated only on technical aspects. Already, in 1957, the talented Leningrad director of scientific-popular movies, Pavel Klyushantsev (1910-1999), launched a biopic, The Road to the Stars (Doroga k zvezdam), to mark the 100th anniversary of Soviet space rocket pioneer Konstantin Tsiolkovskiy (1857-1935). In its last 30 minutes the film includes impressive views of the future (based on Tsiolkovskiy’s blueprints), showing mankind’s conquering of the universe (with orbital space stations, moon settlements and interplanetary spaceships). Its special effects exceed even The Heavens Call. Also, the fact that The Heavens Call wasn’t produced in the central Mosfilm studio by a well-known director, but in the regional, though still prestigious Dovzhenko Studio in Kiev, tells us something about the obstacles the film had to overcome. In general, the Soviet cinema rarely used its “magic” to broach the topic. In 1961, Pavel Klyushantsev together with the famous SF author Aleksandr Kazantsev (1906-2002), who functioned as scriptwriter, released the most well-known Soviet SF movie of the period, Planet of Storms (Planeta bur), about a space flight to Venus. Again, two years later, the Odessa film-studio launched Karyukov’s second SF film about the conquest of the universe, A Dream Come True (Mechte navstrechu). This was the last Soviet SF movie about outer space until 1967 (4). The small number of these films (none produced by Mosfilm) points to the difficulties the studios had in visualising and dramatising such an extremely ideologically loaded topic. Furthermore, none of the films were financially successful or could aesthetically compete with other highly creative Soviet movies of the Thaw period. Ironically, the most successful SF film of the time did not focus on outer space but was a screen adaptation of Amphibian Man (1962, by Genadiy Kazanskiy), based on Aleksandr Belyaev’s Latin America-set novel Chelovek-amfibiya (1928). The prominent SF critic and film reviewer, Georgiy Gurevich, complained that whereas Hollywood produced plenty of entertaining SF films, the lack of presentable Soviet feature films about the future suggested the approval of “our foreign enemies”, those who “asperse communism, in describing it as an empire of weariness and coercion” (5). According to Gurevich, the reason for this failure is rooted in deep prejudices among filmmakers against what was perceived as an intellectually undemanding genre (6). Nevertheless, while Soviet producers and directors weren’t very enthusiastic about the topic, and produced only a small number of films, these films were reworked and footage from them reused several times in the United States. Francis Ford Coppola, for instance, requisitioned nearly all of the footage from The Heavens Call for Battle Beyond the Sun (1965). Also the American version of Planet of Storms, Voyage to the Planet of Prehistoric Women (1968), recycled some shots of spaceships and space stations from The Heavens Call. Although there is hardly any serious research done on this matter, these Soviet movies which envision a “cosmic period of mankind” seem to not only have influenced Kubrick’s 2001: A Space Odyssey, but the “outer space” aesthetics of American SF films more generally. Moreover, the all too eager American astronauts overtook the Russians in reality, turning their bold Soviet cosmic fantasies into nightmares as they made their way to the moon. Boris Lyapunov, “Na ekrane – budushchee (Fantastika i realnost)”, Nauka i zhizn no. 12, 1961, p. 55. On the topic of media and Soviet society in general see J. P. Telotte, “Revolution as Technology: Soviet Science Fiction Film”, A Distant Technology: Science Fiction Film and the Machine Age, Wesleyan University Press, Hanover, 1999, pp. 28-46. For more details see Evgeniy Kharitonov and Andrei Shcherbak-Zhukov, Na ekrane – chudo: Otechestvennaya kinofantastika i kinoskazka (1909-2002), Materialy k populyarnoy entsiklopedii, Moskva, 2002. Georgiy Gurevich, Karta strany fantaziy, Moskva, 1967, p. 11. The lack of good SF movies was not caused – as often suggested – by the imposition of tough censorship. Tarkovsky’s masterpiece, Solaris, was produced by Mosfilm in 1972 at a time when the political situation was much more difficult than in the Khrushchev era.